Here is a PDF copy of the presentation that was given to County Council on 9/6/2016 regarding the Preventative Maintenance Program for our sewer system. 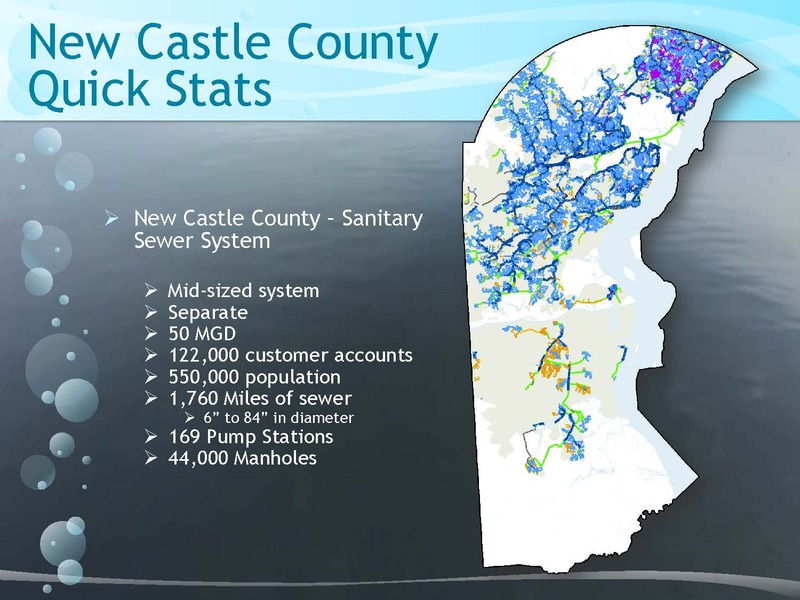 We have 1,760 miles of sewer in New Castle County and this presentation outlines the methods and schedule for maintaining the system. The Department of Special Services is currently conducting beta testing in the subdivision of Green Acres to determine the cost effectiveness of the clear water disconnect program. Once this is completed, a notice of path forward will be provided by the Department. New Castle County is seeking priced proposals for professional services with a communications/marketing firm to handle all aspects of a public information campaign to assist the public to understand and participate in a Clearwater Disconnection Program. The Clearwater Disconnect Program is for sewer customers in the Brandywine Hundred area and is an effort to reduce non-effluent water from entering the County’s sanitary sewer system which causes capacity issues. Clearwater connections in homes convey groundwater or stormwater into the sanitary sewer system in violation of the County Code. Of the roughly 24,000 properties in Brandywine Hundred, New Castle County estimates that as many as 3,600 homes may have existing clearwater connections. Residential clearwater connections send more than 28 million gallons of non-effluent or “clear” water per day into the sewer system during a heavy rain, causing capacity issues. Through the new Clearwater Disconnect Program, sewer customers will be eligible for incentives to disconnect existing punctured floor drain and sump pump connections, provided they allow the County to inspect the system before and after the disconnection is complete. The County will assist plumbers and other qualified contractors with training on code compliant clearwater disconnections and routing, and will create a homeowner handbook about clearwater connections, the work needed to disconnect such systems, and typical designs. Clearwater removal is the cheapest infiltration and inflow (I & I) removal method available on a cost-per-gallon basis. Clearwater connections are illegal but widespread in Brandywine Hundred. There are also scattered clearwater connections throughout the rest of the County. Most homeowners with a clearwater connection do not realize they have one. 2. Clearwater connections are illegal but widespread in Brandywine Hundred. There are also scattered Clearwater connections throughout the rest of the County. 3. Most homeowners with a Clearwater connection do not realize they have one. 4. Disconnections paid for totally by the County will lead to unreasonable expectations by the homeowners and needlessly drive up the cost. 5. Disconnections paid for and totally controlled by homeowners will usually be done as cheaply as possible and may not be satisfactory to the County or the homeowners. 6. Some properties will be too expensive to disconnect and need a mechanism to allow the Clearwater discharge to be legally granted or grandfathered. All disconnections are done by the homeowner or by a homeowner hired contractor. Pre and post inspection by the County. The County will develop a homeowner handbook that shows what needs to be done and provides typical designs. The County will also hold training workshops for plumbers and other qualified contractors who may wish to do this work. The list of attendees will be published on the County website for homeowners to use in selecting a contractor.